I searched for a peach toned blusher for a while but couldn’t seem to find one that was really pale and lightly shimmery. I came across this product when I was on holiday in Tenerife in one of many cosmetic stores and totally fell it love with it. I waited until I returned home to buy it from Feel Unique when they had a 15% sale. I hadn’t tried any Shiseido products before but had heard very good things about their cosmetics. It comes in two colours, but I bought in Sunset Glow, rather than Terra-cotta Glow. The packaging is really cute, with a domed purple casing that opens to two layers – a brush and the blusher. The brush is so soft and perfect for creating a contour line. This is the reason that I love this blusher so much. 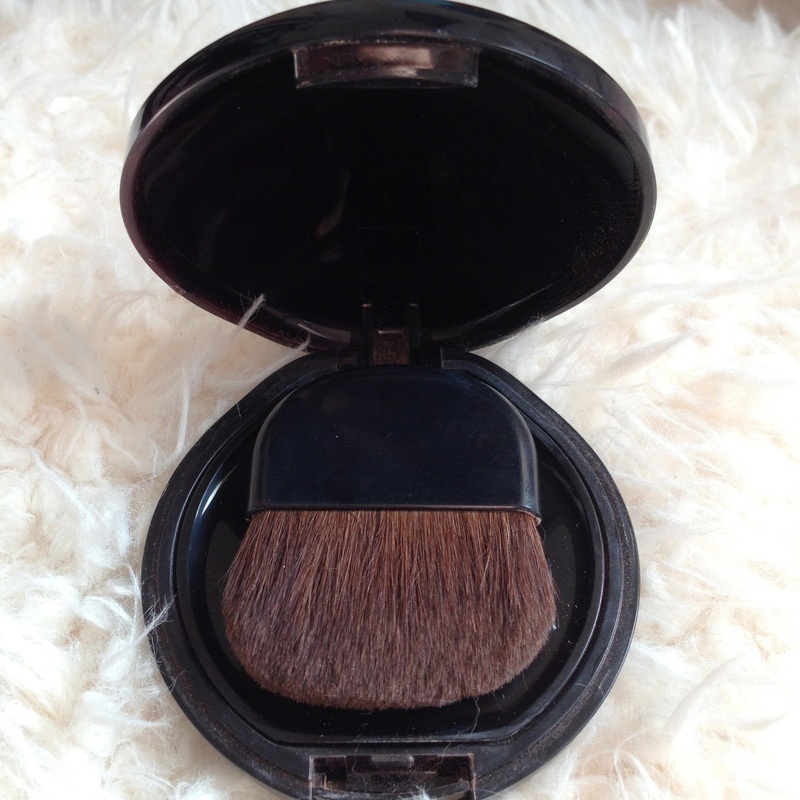 I use the darker shades with the small brush and create a contour line on the hollows of my cheekbones. I then use my Mac 168 large angled contour brush with the light shades and brush them over the apples of my cheeks, placing more of the lightest shade onto the top of my cheekbones as a highlighter. 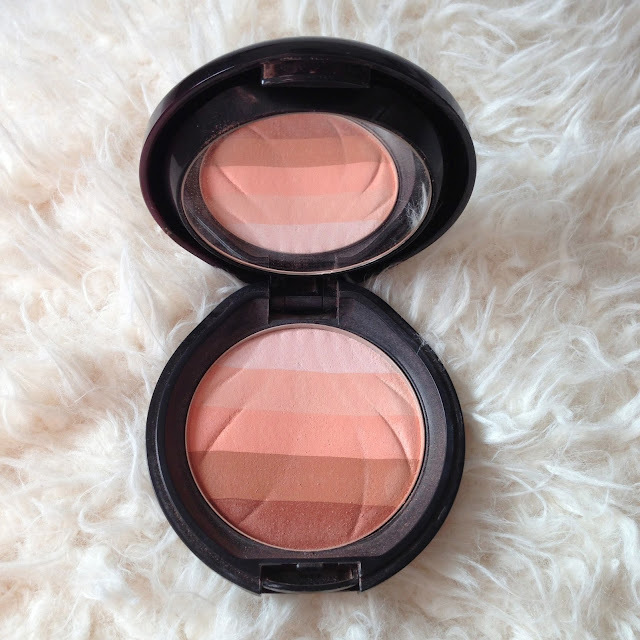 This product then becomes both a contour, blush and highlighter, making it perfect to take with you for on the go. I must admit though, the brush has shed a few times, but I don’t mind living with it due to how soft and useful it is. The colours are gorgeous used separately or used altogether when you sweep your brush straight through the powder. 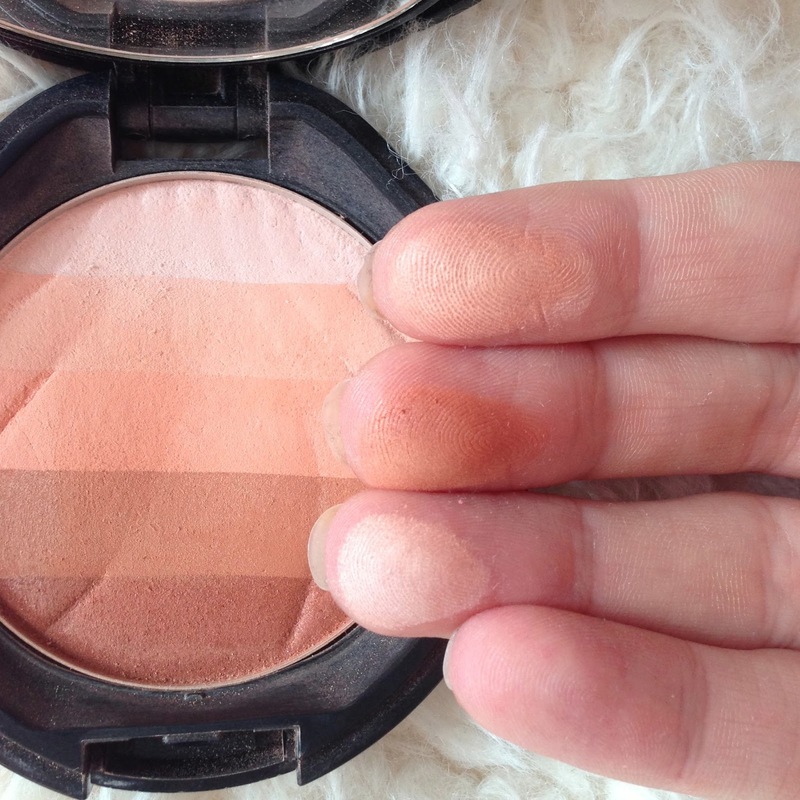 I find that by doing this, when you apply it to your cheeks, the light picks up the alternative shades on the different areas of your face, so that your cheek hollows and cheekbone seem to be highlighted and shadowed without much effort. The colours are really pigmented but build-able, so that a few sweeps of the blusher will leave your face with a subtle glow. Sweeping more of the colour over your cheekbones will build up the colours to the shade you are after. Like I mentioned, using the darker shades as a contour colour works really nicely. I have swatched the colours below. My index finger at the top I rubbed through the whole palette blending all of the colours together. As you can see, it gives a really lovely bronzed peach glow, as the name of the product suggests. My middle finger I rubbed through the three top peachy shades, which shows how light and shimmery they are, perfect for highlighting. My third and ring finger I rubbed through the bottom two darker shades to show how they can be used as a contour, bronzer colour. Hopefully this gives you a bit more of an idea of how they can be use separately or together as a contour, blush and highlighter. I’m sure that it could also be used all over the face as a shimmery and glowing bronzer, especially for those with deeper skin tones, I think it would look gorgeous. I really love this product and it is perfect for touch ups on the go. I just wish it wasn’t so expensive. I’m sure their must be a cheaper, drug store duplicate – I’ll keep my eye out and let you know if I find one. 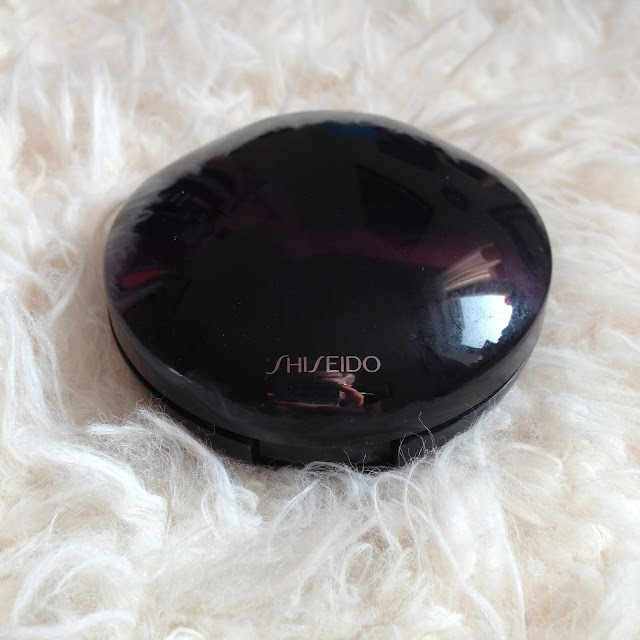 What’s your favourite Shiseido product? Have you tried this one?